Custom maps can be ordered in sizes ranging from 8.5"x11" to 42"x46". For details on custom mapping, please contact us or see our Mapping Fees. Select maps are also available for download in .pdf file format from our downloadable data webpage. Please note that downloadable maps are current as of the date prepared and may not reflect changes that have since occurred. 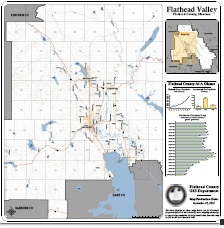 This 42"x42" map of the Flathead Valley Floor is one of our most popular maps. Transportation data (as shown on this map), taxable parcel boundaries, and infrastructure data is all maintained in the GIS Department and available for order. 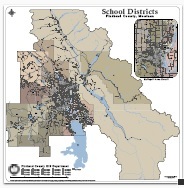 This 42"x42" map of School Districts in Flathead County is an example of the boundary maps that can be ordered. Boundaries for Fire Districts, Herd Districts, Legislative Districts, Water/Sewer Districts, and Zoning Districts are all maintained in the GIS Department. Because the data for many districts is constantly changing, please contact us to request a current map. This 36"x36" map portrays the landscape of Flathead County with shaded relief representation. Maps can be customized to include different types of imagery data, such as aerial photography or USGS topographic maps. Due to size constraints, this map is not available for download. Shape files are available for download in a zip file format from our downloadable data webpage. These files are updated on a nightly basis, but the currency of the data will vary. Please note that this is only a sampling of our data. If you do not find what you need, please contact our office. Tract Maps are available for download by section in TIF file format. These files are updated as new surveys are filed in a given section. Data is provided in Montana State Plane Coordinates, North American Datum 1983 in Meters. Please note that this data does not meet surveying or engineering standards and is not intended for design purposes. *Watch a 1 minute video of the Subdivision Growth in Flathead County since it's inception in 1893. *Watch a 30 second video as the Brush Creek Fire of 2007 explodes in a matter of days from a two acre fire to more than 600 acres.